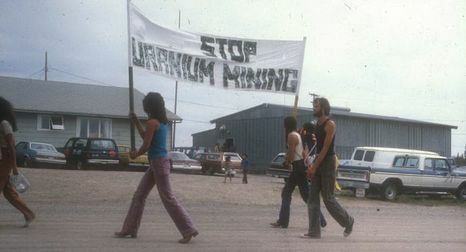 A film examining the deadly impact of uranium mining on Native lands and peoples, workers and settlers in Canada. Anna Mae Pictou Aquash and John Graham, friends and comrades in the American Indian Movement, both fought against uranium mining and the theft of Native land. Now, the US government has extradited John Graham from Vancouver and imprisoned him on the fraudulent charge of killing Anna Mae, a murder that the FBI first tried to cover-up when her body was found in 1976 on the Pine Ridge Indian Reservation in South Dakota. Most likely, Anna Mae was one of over 60 indigenous people killed on the reservation in the 1970s by an FBI-backed death squad designed to destroy AIM and the Lakota people’s resistance to land theft by resource corporations.